The Warriors bounced back Sunday night, beating the visiting Detroit Pistons, 121-114. The Warriors hardly looked like themselves in a 35-point loss to the visiting Dallas Maverick Saturday night. With Stephen Curry resting, they were dominated from the tip, managing just 13 percent from the three-point line and struggling to string together defensive stops. After the game, Steve Kerr said they would “flush this one down the toilet and move on.” That’s what they did. From the opening tip Sunday, the energy was noticeably better. The offense ran with better fluidity — also a byproduct of Curry’s return — which frequently resulted in open shots. The Warriors shot 61.3 percent from the floor and 52 percent from three-point range. Golden State had seemed to turn a corner defensively last Thursday, after allowing 89 points to the Indianapolis Pacers and about 99 points per game over the previous five contests. That’s why the lack of defensive intensity in Saturday’s loss was surprising. The Warriors were much sharper defensively Sunday. One play epitomized Golden State’s defensive prowess, from the player who usually ignites everyone on that side of the floor. 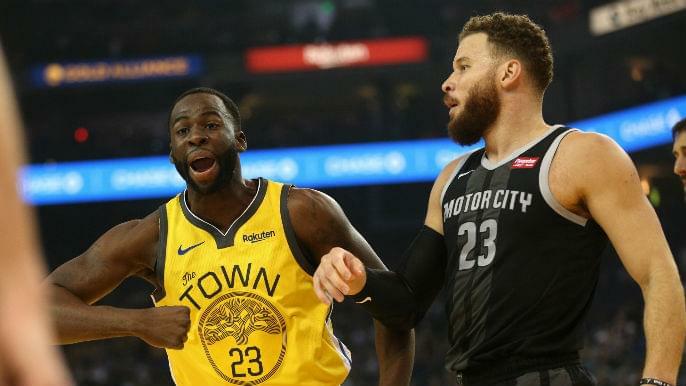 In the first quarter, Blake Griffin backed down Draymond Green with little success. The one-on-one matchup went on for several seconds, until the shot clock sounded, and Griffin’s desperation heave was too late. The Warriors held the Pistons to 46 percent shooting. One night after allowing Dallas to make 21 threes, Golden State gave up just 12 from Detroit. Sunday night showcased all of what makes Curry so entertaining. In the first quarter, he crossed up Andre Drummond, leaving him stumbling backwards, and nearly finished a circus layup. In the third quarter, Curry crossed over Ish Smith and nearly finished a swooping layup over Detroit’s big men. Curry’s handle was on all night. So was his shooting. After a quiet 15-point night Thursday, Curry tallied 26 points on 5-10 from three-point range. He opened Golden State’s scoring with five straight points, one three-pointer and another pull-up jumper. Curry methodically poured in his buckets throughout the game. He made a deep three with about five minutes left and sunk a floater with under a minute to effectively seal the win. Curry’s presence changes everything, and Sunday was another example. After tallying just 22 assists Saturday night, the Warriors had 31 assists Sunday night. The Warriors didn’t sign Bogut to run a solo fast break, but the 34-year-old showed he was capable Sunday. In the opening minutes of the second half, Bogut pulled down a rebound, charged to the other end of the court, dribbled behind his back, and finished over Drummond. Bogut started in place of DeMarcus Cousins, who took the night off to rest. The Australian native put together his best game since joining the Warriors last week. He made four of five shot attempts for eight points, to go with five rebounds, three assists, and three blocks. One of the many negative aspects of Golden State’s 35-point loss Saturday was the rebounding disparity. The Mavericks out-rebounded the Warriors, 49-36. That was with Dirk Nowitzki, virtually a non-rebounding threat, starting and playing 26 minutes, the second-most for him all season. The most traceable reason, like the defensive struggles, came down to effort. That improved Sunday night. The Warriors out-rebounded the front-court loaded Pistons, 38-29, on the glass. That the Warriors did that without Cousins, and with Bogut in the lineup, is encouraging. Kevin Durant was impressively accurate from the floor in Sunday’s win. He made five of six attempts. Yes, he shot only six times. Durant prides himself on finding the right shot. He’s one of the most patient superstar scorers in history. That has especially been true recently. On Tuesday, he made seven of 13 shot attempts. On Thursday, he made six of nine attempts. Saturday showed the opposite: Durant hoisted 12 shots in the first quarter alone. On Sunday night, he was back to being ultra-selective. Durant rarely looked for his own shot when he drove to the hoop, choosing to pass it off instead. It turned out Sunday was historically anomalous: Durant’s six attempts are the fewest in a game in which he has played more than 11 minutes in his nine-year career.